You know how when you’re doing something else, but see a coyote, and then you’re coyote hunting? That is not the only time something like that happens.I was out tagging calves yesterday and while driving across the pasture, I glanced at the ground outside the pickup window and gasped at what I saw growing there in the grass. 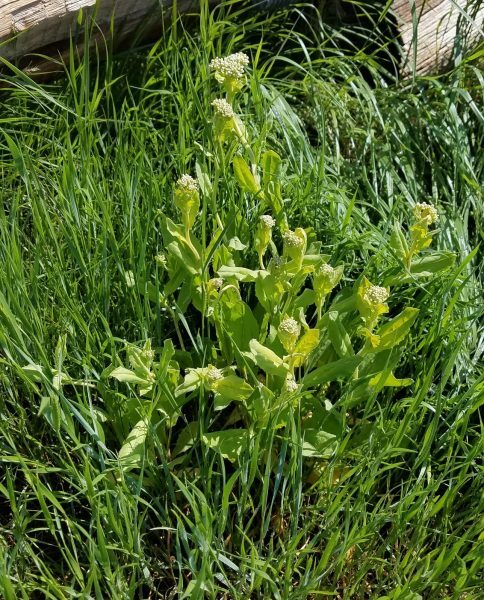 HOARY CRESS! My arch enemy. The most loathed weed of them all. The invasive, insidious, nasty, ugly, demonic, horrible, terrible, pasture thieving, damaging hoary cress. Suddenly, instead of fencing or any of the other things I had planned for the day, I was spraying weeds. I hastened to the shop, grabbed my big water jugs, needed combination of lethal chemical weaponry for the killing of the stuff, and headed back out. I scouted it out, figured out where to start and began the miles of walking and spraying necessary to have even a minor victory over old HC. Long before moving to my new place, the war with hoary cress began. I have sprayed and sprayed and sprayed the stuff, searching out every patch and single plant that I could find, for years now. I was definitely winning at the old place, as I just had a few places where the seed had lain dormant and would sprout a few in the spring. When I looked at this place, I knew there were two patches of the weed, but it was in full bloom and I didn’t yet have possession of the place, therefore couldn’t do anything about it. I took pictures though, so this spring, when the stuff was starting to sprout, I knew just where to spray. I sprayed and sprayed and have laughed maniacally over the slow yellowing of the evil plants, thinking to myself how the roots were slowly dying as well. Victory! Then I found some out in the big hay corral around the piles of posts. I sprayed that. I’ve walked and scouted for it for weeks and had hoped I had found it all. But alas, the deer have planted it across the hay field in the calving pasture, along an old road bed, on the edge of a draw. I know it’s the deer. They eat the dried seed heads and the seeds survive the whole digestive process and are planted, with a neat little ball of fertilizer included, wherever deer do what deer do. With my years on the battlefront with the stuff, I have gotten to where I can spot it from a great distance. Kind of like a turd in a punch bowl to me. It practically glows. It’s not just a weed anymore. I positively despise the stuff. It’s become personal. Before you think that I’ve tipped over the edge about a mere weed, let me tell you about it. It’s an invasive species that can absolutely take over tens of thousands of acres of pastures and fields. It grows from seeds, but also spreads by the roots, popping up in ever broadening circles like ripples on water, until it has actually choked out all the grass and other forage. It’s one of the only weeds that can’t be diminished by proper pasture management. Usually, excessive grazing or trampling is what brings on weed patches. Hoary cress loves those situations too, don’t get me wrong, but it can also just take over wherever the seeds land. It doesn’t care whether it is dry or wet, windy, hot or cold, it thrives. I get a facial twitch just telling you about it. There are several herbicides that will kill it, thankfully, and the one I use doesn’t harm the grass and isn’t harmful to livestock if they graze the area after spraying. Obviously, this battle would be much easier on me if I had a fancy spray rig. I do not. A four wheeler or side by side would be darned handy, but since I don’t have either, I use my feet. So far, ol’ Shank’s Mare has got it done. I’ve had women ask me what workout routine I use to have my arms “toned” like I do. None of them seem to appreciate my offer of helping them tone their arms by various methods, including but not limited to, fence stretchers, tamping bars, post pounders, and of course, the three gallon weed sprayer. I walk miles with the sprayer, which starts out at a solid 25 pounds when full. One also has to consider that that sprayer has to be hand pumped, frequently, to be pressurized in order to spray. Yep, no flapping “wings” on my aging arms. So, the battle will continue. I WILL prevail. I’m dreaming of having a side by side to do this with in the future, but until then, my hand sprayer and I will continue. So, if you see me driving along and suddenly I jam on the brakes and bale out, you’ll know what I’m doing. The crazy woman has seen HOARY CRESS.